May I ask for a similar log while reviewing an image, with the io_trace_full branch? That should cover JPEG decoding and might be easier to understand. Also getting closer to emulating a CR2 image capture. Emulation reaches sdfExecuteMem1ToRawPath (FrontShtDevelop), attempts to configure JPCORE and gets stuck requesting image data from EDMAC channel #3, connection 5. I believe that's where the firmware expects LJ92 data from the lossless encoder. Sure , I'll do that right always . I also by mistake I reviewed a H264 .Mov in io-trace-full and logged , lot of resizing jpeg stuff , not sure if it will be of any help. That's great ! I'm going to try to see what happen on cam. Having problems compiling lossless silent.c , what branch should I be using ? "compressed_raw" , "crop_rec_4k" or ? I was using dfort's "crop_rec_4k_Digic4" but now that's giving me errors . Was working a few mouths ago , I just clone it , so its fresh . I'll try tomorrow again. @dfort , can you compile your "crop_rec_4k_Digic4" ? Do I really need the piece of code that's between the 2 asterisk ? Only for the 7D and was trying just the silent module to see if I could get lossless compression working. Hit a wall a while back and put it aside. No, that's copied from my log file and commented out. I was using it as reference. How do you run the EOS M6 into qemu ? There is already a structure for the M5 therefore I've tried the CHDK dump from https://drive.google.com/open?id=0B08pqRtyrObjWVdWVGVwakVmcjQ#list but there is only a PRIMARY.bin file; how do split it to have the expected ROM0.bin and ROM1.bin ? Before going any further, can I use qemu to use the default Canon's basic scripting, instead of constantly moving the SD card in/out of the camera/laptop ? I'm not going to emulate ML or CHDK. So far I've installed qemu from the ML qemu branch (followed the README from the contrib folder) which is version 2.5.0. Is this version not too old? ...there is a qemu-2.9.0 branch but it's not maintained since April last year. I didn't look into M6 yet, as PowerShots are not exactly my primary focus. I won't be able to look into it during the next few days, so please find the general notes for emulating a new camera model. PRIMARY.BIN is one of the two ROMs; you will need to know its start address and specify it in model_list.c (or, if that address already matches some existing model, maybe M5, start from there). Just FYI, srsa_4c was able to run the A2300 GUI in QEMU, based on some draft A2200 patches from me. Came up with a recurring problem -- how to get into the ML menus in QEMU. Depending on the camera there is a different keystroke combination. Right now I'm looking at the EOSM, the Canon menus come up fine and I can get into LiveView but for the life of me I can't find my notes on how to get into the ML menu. Another suggestion for the forum moderators -- how about making "How to run Magic Lantern into QEMU?!..." a sticky topic? It's always the same key as with regular ML. For example, on 1100D, user has to press the Av button, which is shared with Delete. In photo mode, this button behaves like the regular Av button on other models (same button code coming from the MPU). So, in the emulator, you press the Av key, i.e. A. On EOS M, that's a long press of the Delete button (i.e. down arrow), but as the LiveView emulation is not perfect, you'll need to press L a few times to work around some GUI mode switching issue. After a bit of trial and error, the menu should appear. Just tried: M M L Down(long) showed up the long-press indicator, then ML menu showed up. It also seems to work with the Delete key, as ML interprets that button code as well in a generic way (for all models), but I'm pretty sure the hardware doesn't send that button code in LiveView, so it's not very accurate. EOS M also opens ML menu with a double tap on the screen or something like that. I've got draft patches for touchscreen emulation, just need to clean them up and commit. Thanks -- M M L Down(long) worked here though I didn't see the long-press indicator. The camera boots into LiveView and only requires Down(long) so maybe those extra steps required in QEMU could be added to the documentation and/or the model specific F1 help menu? BTW--On the EOSM and other cameras (i.e. 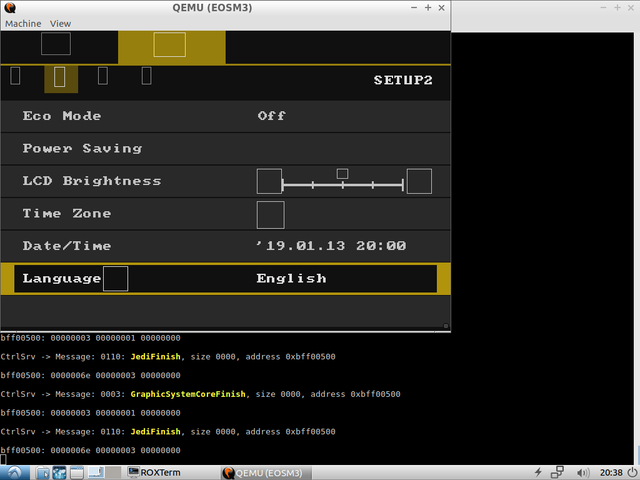 100D) the SET and Q button are combined but in QEMU they behave differently. Maybe add that the down key is also the Trash button? The MPU code only knows it's sending the Down key; it doesn't care how the main firmware interprets it later. In PLAY mode or Canon menu, the MPU might send the Delete code (not 100% sure; you may check that with a MPU log - look for "06 05 06"). Other than deleting images, is the Delete button used anywhere else in Canon menu, where I could test it? Same for the SET/Q button (which is handled identically in 100D, EOSM and EOSM2): in some GUI modes it behaves like SET, in others it behaves like Q. QEMU doesn't know that - for now, you need to press the appropriate button, i.e. to know what button code the MPU is going to send. The MPU code is not that smart, it just does a simple mapping between PC keyboard codes and MPU button codes. This reminds me I also need to add a definition for the Delete button for 1100D & co (which is shared with Av). In photo mode, that button behaves like Av. In Canon menu, e.g. in the Format dialog, that button apparently behaves like Delete (don't see how otherwise you could toggle the low level format option). Still waiting for info on how the Delete button behaves in Canon menu on EOS M/M2 (previous post). Capturing a MPU log with the linked build should be enough, as long as you press the Delete key somewhere in Canon menu and somewhere outside it. No need to compile or do complicated black magic; anyone can do it. Still waiting for info on how the Delete button behaves in Canon menu on EOS M/M2 (previous post). Here's a log for the EOSM. The EOSM2 will require some more work. Looks like the builds you posted have some changes that were not committed. Held down the Trash (a.k.a. down key) in LiveView, which brings up the ML menu then did the same with the Canon menu. I'm once again having problems getting the EOSM/EOSM2 running in the latest QEMU. Went over previous discussions and I believe I'm doing it right. Other cameras I tried (700D/1300D) seem to run fine. Something went wrong after 2.267353 seconds; memory corruption? Reproducible? Can you try with build #21 as well? That's a little less verbose, so it would allow for longer experiment times, but it will only log the MPU messages and nothing else. Reproduced the crash on the Mac VM. Workaround: comment out the call to find_rom_string in debug-logging.gdb, until I'll figure it out. For some reason, I'm unable to run QEMU under Valgrind on the Mac VM (possibly this bug); if you are able to do so, I'd like to see a log. From skimming that bug report, running QEMU under Valgrind might be possible on Mac OS older than Sierra (my Mac VM is High Sierra). Edit: after building valgrind from source and applying these patches, it still doesn't work. Compiling QEMU with -fsanitize=address helps and points to a stack buffer overflow error during GDB communication. Fixed by this commit. BTW, for regular use (i.e. if you don't need to log all of that stuff from debugmsg.gdb), it's best to use patches.gdb, as it's much faster. Really? I didn't notice anything unusual with the camera but yeah--there is a problem. Tried starting in different modes and the only clean log is when starting in playback mode and leaving it in playback mode until it finishes logging. Ran the test with Build #21 and this one had a clean finish. Saved log in the same Dropbox folder. If that works for you I'll try to do the same with the EOSM2. Workaround: comment out the call to find_rom_string in debug-logging.gdb, until I'll figure it out. Thanks, back up and running with the EOSM/EOSM2. Maybe the code I'm looking for only shows up when you actually try to delete some picture? Can you try to log that action as well? That unknown GUI event has the same code as "Unpress AV" on other models. Likely some internal event used during GUI mode switching. Tried starting in different modes and the only clean log is when starting in playback mode and leaving it in playback mode until it finishes logging. Well, that's an issue I'd like to narrow down, then. It should now work on Mac without any workarounds. Start in play mode, delete picture -- log saved in same Dropbox folder. LOL -- I thought we made some great progress on the EOSM2 but now can't get it working in QEMU though the original EOSM works fine now. I should qualify that. By "work" I mean able to bring up the GUI. The EOSM2 starts up on a grey screen, pressing the "M" key brings up the Canon menu. Pressing the "M" key again gets out of the Canon menu and from there the down arrow key should bring up the ML menu but I can't seem to get it on the M2. It is finicky but possible on the M. Note that I had more luck with "fn delete" on the Mac keyboard. Maybe the main firmware really re-interprets the Down key in PLAY mode (i.e. it performs the Delete action instead). Any luck with the verbose logger on the same action? Reproduced the issue on EOS M2... after swapping SFDATA.BIN with an older one from 100D. The good one (likely from you) starts with 55 03 00 80 in a hex editor (0x80000355 is the model ID for EOS M2) and has MD5 f8c4d7fa1d7ceb4cade8b98b3573c375 (likely not essential, but could be useful to narrow down). It also works with -icount 5 (which is deterministic, i.e. it will get exactly the same execution trace on all systems, as long as you use the same ROMs). Otherwise, both commands are working fine in QEMU (including on the Mac VM). If ML menu doesn't show up, press L a few times (as LiveView emulation is not the best). Before pressing L, Canon overlays are gray, but afterwards they should turn black and that's when ML menu works. I wonder if emulating "just" the video timer interrupts could be enough for fixing this quirk. Any luck with the verbose logger on the same action? Nope -- log keeps borking at the same place. Strange. Found that good SFDATA.BIN and tried it with the dumps I sent you, in fact tried it with all the dumps I have and can't get out of the grey screen. The default qemu autoexec.bin works fine with any combination. Know what to do with that information I do not. For the EOSM2 I created a patch with the changes made on the "Project startup-log-mpu" EOSM by copying the information from the autoexec.bin file. That's a great feature by the way. The EOSM2 created a full log without borking. Same action as before--down key (trash) on LiveView (brings up ML menu) then down key in Canon menu. But on EOS M3 the camera controller still does not allow to start it normally and goes to shutdown. CtrlSrv -> SflwWrpDrawStringWithinRect [0000,0222]: No Image. Any idea how to render these strings on QEMU VGA screen? Awesome, looking forward to trying this one! Some time ago I've extracted the VGA font routines (fixed-width, fixed-size) from QEMU console code. It won't look pretty, but at least you'll see something. These routines are meant to be used in the display callback procedure, somewhere before dpy_gfx_update. In any case, it's not in sync with the program execution. If you receive these strings from MMIO hooks, or from breakpoints into certain drawing functions, you will need to store them somewhere in a data structure, until the next display event comes up. but, of course, you will need some library to draw the fonts (some suggestions, or maybe even CHDK/ML RBF engine). If you receive these strings from MMIO hooks, or from breakpoints into certain drawing functions, you will need to store them somewhere in a data structure, until the next display event comes up. I recieve these strings from eos_handle_digic6: mzrm_send function writes 1 into register 0xD20F0840 to inform Zico core about new message. printfxy(surface, (pos_x >> 16), (pos_y >> 16), "%s", MZRM_str);Do I need to update the display somehow? Even calling printfxy from eos_update_display doesn't work. Also there need to decode images from ROM used to draw icons and some texts in Viewfinder mode. These are vector graphic objects. They can be found by signature "99 99 0C 00" in DSLR's ROMs too. The next 32bit word is a size of drawing object. Probably there need to use OpenVG to render it.